NSW Seniors Card is proud to announce a new partnership with Woolworths, giving members access to exclusive discounts on delivery, gift cards, insurance and telecommunications. Save on delivery fees with a discounted Mid Week Delivery Saver Pass & enjoy unlimited deliveries every Tuesday, Wednesday & Thursday when you spend $100 or more#. You can start using your Mid Week Delivery Saver Pass as soon as you add it to your cart. 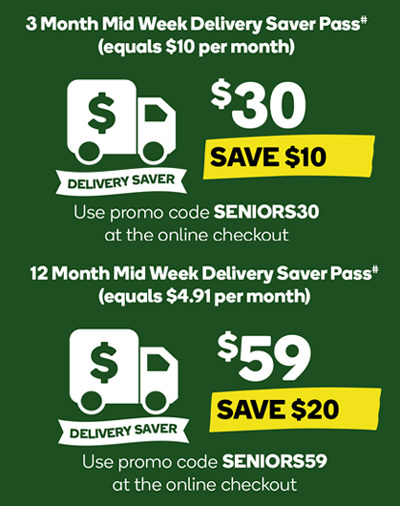 To access the discount at the checkout just enter promo code SENIORS30 for the 3 Month Mid Week Delivery Saver Pass or promo code SENIORS59 for the 12 Month Mid Week Delivery Saver Pass. Big telco coverage. Supermarket Prices. Our Pre-paid Starter packs are perfect for those who don't want to be tied down to contracts and want the freedom to change plans whenever you want. With unlimited talk and text, and supercharged with even more data, you can connect to more of what you love. Every Woolworths SIM only plan is packed with data backed by our zero bill shock promise, unlimited standard national calls and SMS. All for use on Australia's trusted mobile network that covers over 23 million Australians***. Plus, get bonus Woolworths Rewards Points with every plan, so you can save big on your grocery shop. Big insurance cover. Supermarket prices. Enter promo code SENCAR when you get a quote online today! Enter promo code SENHOME when you get a quote online today! Enter promo code SENPET when you get a quote online today! #Conditions apply. To be eligible for this offer you must be a valid Seniors Card member and enter one of the promo codes available at woolworths.com.au/seniorscard at the online checkout at time of purchase. Pass is not refundable and cannot be cancelled. A minimum spend of $100 per order applies otherwise regular delivery fees will apply. Pass not valid for Express Delivery and remote delivery orders. This offer is valid till 2 October 2018. Check online for available delivery areas, available delivery windows and order cut off dates. See woolworths.com.au for full terms and conditions applicable to shopping at Woolworths Online. ^ Apple, the Apple logo are trademarks of Apple Inc, registered in the U.S. and other countries. App Store is a service mark of Apple Inc. Google Play and Android are trademarks of Google Inc.
Offer valid from 16th October to 30 October 2018. Offer available online only. To be eligible for this offer you must be a valid Seniors Card member. Not to be used in conjunction with any other offer. Woolworths Mobile reserves the right to vary the terms and conditions of the offer at its reasonable discretion by publishing revised terms on woolworths.com.au/mobile. Woolworths reserves the right to cancel the offer at any time. *Enter the promo code available at woolworths.com.au/seniors20 at the online checkout. Visit woolworths.com.au/seniors20 for full terms and conditions. **Enter the promo codes available at woolworths.com.au/seniors10 at the online checkout. Visit woolworths.com.au/seniors10 for full terms and conditions. *** Our network covers more than 23 million Australians based on a total 3G and 4G network coverage of 98.8% of the Australian population of 24,127,200 (ABS, Jun 2016). ^^ To be eligible to receive 10% off recharge, you must be a Woolworths Rewards Member and either present your registered card in a participating store when purchasing a Woolworths Pre-paid Mobile recharge voucher or online at woolworths.com.au/mobile. This 10% off offer excludes residents of Tasmania. †Our network covers more than 23 million Australians based on a total 3G and 4G network coverage of 98.8% of the Australian population of 24,127,200 (ABS, Jun 2016). Valid for a limited time and cannot be used in conjunction with any other offer. Applies to Comprehensive Car Insurance policies only. The $50 Woolworths Gift Card will be sent within 45 days of the first premium being paid. Card is issued by and remains the property of Woolworths and may be used at participating stores only. The Card is not redeemable or reloadable for cash. Full terms and conditions at everydaygiftcards.com.au. Up to 10% discount consists of a 5% saving for online applicants, saving in first year only, and up to 5% off to exclude drivers under 25. Minimum premiums may reduce savings discount. Applies in the event of a total loss, provided you’re the first registered owner. Valid for a limited time and cannot be used in conjunction with any other offer. The $50 Woolworths Gift Card will be sent within 45 days of the first premium being paid. Card is issued by and remains the property of Woolworths and may be used at participating stores only. The Card is not redeemable or reloadable for cash. Full terms and conditions at everydaygiftcards.com.au. Up to 30% discount consists of 3 parts: 10% promotional discount for a limited time only & 10% off for online applications, both these discounts apply for the first year only. Receive a further 10% off when you combine Home & Contents policies, applies for the life of the combined policy. Minimum premiums and standard underwriting criteria apply. Not to be used in conjunction with any other offer. Applies to new policies only. Valid for a limited time and cannot be used in conjunction with any other offer. The $50 Woolworths eGift Card will be emailed to the email address provided within 30 days of the first premium being paid. The eGift Card is issued by and remains the property of Woolworths and may be used at participating stores only. The eGift Card is not redeemable or reloadable for cash. Full terms and conditions at everydaygiftcards.com.au. only available if the quote is genuine – written proof of quote may be required. Please note covers provided by insurers will vary. Benefit limit amounts vary by level of cover. The up to $12,000 annual benefit level applies to Comprehensive Cover. Limits and excess may apply.